Oyo has previously said that it wants to be the world’s largest hotel chain; it’s now received an investment from the what’s currently the world’s largest hotel chain. Airbnb has invested between $150 and $200 million (Rs. 1050 – Rs. 1400 crore) into Oyo Rooms as a part of its Series E funding round. The investment follows a record $1 billion fund-raise from Ola last year, which had included investors like Softbank, Sequoia Capital and Lightspeed Venture Partners. “Emerging markets like India and China are some of Airbnb’s fastest-growing, with our growth increasingly powered by tourism to and from these markets,” said Greg Greeley, president of homes at Airbnb while announcing the investment. It’s a pretty interesting move from the two companies, because until recently, Oyo and Airbnb were seen to be competitors. Airbnb had been aggressively expanding in India over the last couple of years, signing up homes in a market where Oyo had had a large headstart. Oyo even had a service called Oyo Home, which directly competed with Airbnb’s core offering of letting individual homeowners open up their homes for guests. But with this deal, Oyo and Airbnb have signaled that they want to take on the Indian market together. As a part of the fundraise, Oyo’s listings will appear on Airbnb’s platform. This will help Oyo reach international audiences which are more familiar with Airbnb, and will find it easier to find customers for some 10,000 homes and villas in India, Dubai and some other markets. “Airbnb’s strong global footprint and access to local communities will open up new opportunities for Oyo Hotels & Homes,” said Maninder Gulati, global chief strategy officer at Oyo Hotels & Homes. The deal will also help Oyo take on competition in India. India has no shortage of hotel booking platforms, with companies like MakeMyTrip, Ibibo, and even Paytm all jostling for a footprint in the space. With Airbnb in its corner, Oyo will have a global giant to help it grow its operations, both in India and in other markets. Oyo already is expanding aggressively internationally, and it’s possible that Airbnb and Oyo will look to join forces in some foreign markets as well. 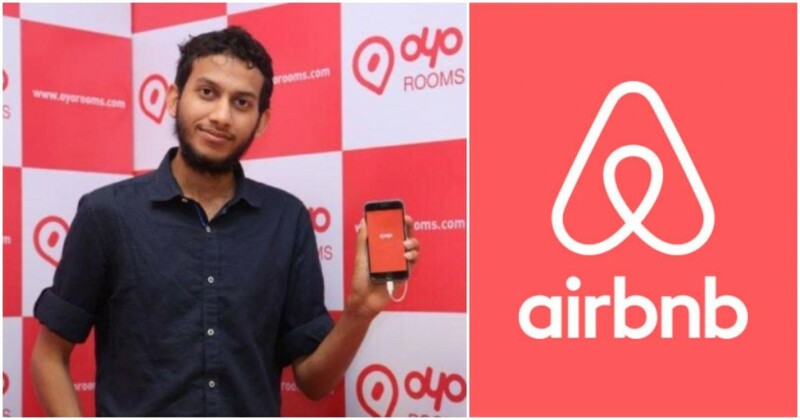 But this investment does mean that even if Oyo does end up becoming the world’s largest hotel chain — CEO Ritesh Agarwal had said that he aimed for it to happen by 2023 — it will happen with Airbnb as an investor. The way Oyo had been expanding in recent months, opening up thousands of rooms in China, and starting operations in the UK, Nepal, Philippines, Japan and even Saudi Arabia, it had looked as though Oyo and Airbnb might have a international showdown at some point in the future. But Airbnb and Oyo are now partners, and if they do come to dominate the world hospitality industry going forward, they’ll be doing it together.